Port of Kalama, home to one of the largest grain elevators on the west coast, welcomes the vessel loading soy at Kalama Export LLC for international transport. Eva makes Port of Kalama first port of call on Maiden Voyage from Greece. The Port of Kalama is alive with shipping commerce and export trade, often welcoming maiden voyages. The Port of Kalama last week welcomed a maiden voyage from international bulk carrier ship, Eva, which hails from Greece. The crew is loading soy at Kalama Export LLC. Eva is owned by Orvieto Navigation Limited of The Marshall Islands. Port of Kalama marketing manager Liz Newman presented Captain Karamanos Ioannis with a commemorative plaque from the Port—a traditional gift for first ports of call to offer ships on their Maiden Voyage. The plaque will remain with the ship for its full life at sea. The Port of Kalama, which is located on the deep-draft Columbia River immediately adjacent to Interstate 5 and the mainline railroad, is home to one of the most efficient grain terminals on the west coast. Two grain terminals and a deep-draft break-bulk terminal are located on the river. About Port of Kalama – Where Rail and Water Meet: The Port of Kalama is located in Southwest Washington on the Columbia River and immediately off of Interstate Highway 5. The port exists to induce capital investment in an environmentally responsible manner to create jobs and to enhance public recreational opportunities. 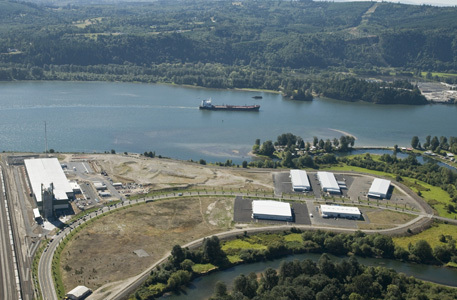 Port of Kalama's industrial area includes five miles of riverfront property adjacent to the 43' federally-maintained deep draft navigation channel of the Columbia River. The Port is served by the Burlington Northern/Santa Fe and Union Pacific railroads. There are over 20 industries located at the Port of Kalama, employing over 800 people. Port of Kalama offers all the superior facilities businesses need to thrive, and an unsurpassed quality of life. The port offers shovel ready sites, a new Industrial Park, state of the art Marine Terminals and transportation accessibility to rail and highway all just a 25 minute drive to the Portland International Airport. Port of Kalama also offers high-bandwidth communications, with dual access fiber-optic service to Seattle and Portland. Properties currently available at the port for businesses wishing to expand and thrive: http://portofkalama.com/industrial_property.